HF: The Hong Kong Mint was established by ordinance on 26th February 1864 and opened on 7th May 1866 under the direction of Thomas William Kinder with the purpose of producing Hong Kong silver dollars and half dollar coins. After two years having incurred a huge loss to the government it closed on 25th April 1868. The image of Kinder has been extracted from the article, The Hong Kong Mint, 1864-1868: The History of an early Engineering Experiment, P. Kevin MacKeown which notes the image is courtesy of PA Crush, Chinese Railway Collection. This obituary was first published in the 1884 Proceedings of the Institution of Civil Engineers, UK. THOMAS WILLIAM KINDER was born in London on the 10th of November, 1817, and was educated at Dr. Fennell’s, the Temple, Brighton. He was appointed ensign in the Worcester Militia in 1840, lieutenant in 1846, and captain in 1853. His regiment was one of those embodied during the Russian war and Indian Mutiny, and he served continuously with it until its disembodiment in 1859, when he was transferred to the 3rd West York Militia, which remained embodied till the end of 1860. He thus, in his varied career, had seven years’ uninterrupted experience of military life, and possessed, in addition, a considerable acquaintance with the minutia of regimental duties, and the principles and tendencies of army organisation. He remained in the 3rd West- York Militia until 1870, when he retired with the rank of major. 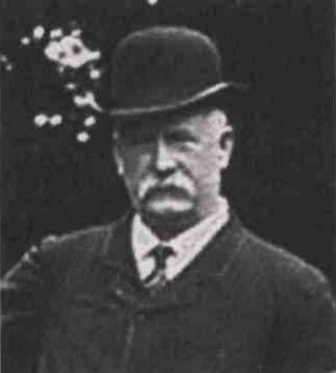 In 1845 he established railway-works at Bromsgrove and Oldbury, of which he was for ten years a partner, and subsequently conducted the locomotive department and working of the Shrewsbury and Birmingham Railway. From 1851 to 1855 he had the management, under lease, of the Midland Great Western Railway of Ireland. Major Kinder was appointed Master of the Royal Mint, Hong Kong, in 1863, the entire organization, construction, and working of which institution he carried out with remarkable energy and approved ability until its suppression in 1868, at the instance of the Governor, the late Sir R. G. McDonnell. At about this period the Japanese Government, desirous of placing the national currency upon a solid basis, and urged strongly in this direction by the British Minister at Yedo, who clearly saw how necessary this step was before the domestic and international exchanges of the empire could be satisfactorily conducted, entered into negotiations with the Hong Kong Government for the purchase of the plant of the disused Colonial Mint, which was at once transferred to Japan. The high character borne by Major Kinder as a successful organizer and clear-sighted Mint-Master, recommended him to the then Finance Minister of Japan as the Director of the new institution, which rapidly took shape under his hands. The difficulties he had to encounter in this work were of an exceptional character, and demanded a combination of qualities with which it may safely be said few men are endowed in so ample a measure as was Major Kinder. But one by one all these difficulties were surmounted, and he gave to the empire of the Mikado a coinage of high artistic merit, redounding equally to the wisdom of His Majesty’s advisers and to the administrative powers of his Mint-Master. The empire was at this time in the throes of revolution, and Osaka, where the new Mint was erected, was not far distant from the provinces still held by some of the most powerful of the daimios, who maintained the declining cause of the Shogunate. It may easily be believed that the safety of his buildings and treasure caused Major Kinder no ordinary solicitude, and he planned and superintended the erection of barracks in the neighbourhood of the Mint, which guaranteed it effectually against dangerous surprises. He added gasworks to the establishment, and subsequently erected works for the production of sulphuric acid, which have since proved very lucrative to the Japanese Government. Major Kinder had the honour to receive the Mikado at the Mint, and subsequently had three or four audiences of his Majesty, one being on leaving Japan in 1875, when the Mikado publicly thanked him for his services. During his stay in Japan, he, in conjunction with the Finance Minister, Enouye Bunda, originated the postal department in that country, and with the same Minister was instrumental in organizing a system for alleviating the miseries of the poor. He also laid the first stone of the Masonic Hall at Kobe, and was its first Master. Major Kinder was elected an Associate of this Institution on the 4th of December, 1860. He had an intimate knowledge of mechanical details, with a far-reaching apprehension of results. Of an energetic character, and possessing great diplomatic tact, had scope been given him, he would have attained a more prominent position. Major Kinder latterly resided at Torquay. He died suddenly from disease of the heart, at the Norwood Junction station of the London, Brighton, and South Coast Railway, on the 2nd of September, 1884. This article was first posted on 4th January 2015.